AOL News: Nadin Khoury, 13, says he was on his way home from school when seven older teenagers jumped him and began punching and kicking him outside an apartment complex. One of his alleged attackers filmed the assault, which went on for more than 20 minutes before a woman driving by the scene leapt out of her car and chased the bullies off. "There's nothing you can do," Khoury told Fox 29 in Philadelphia. "You can't fight back or it comes down even worse. You can't say anything except call for help." Khoury said the group of teens has targeted others as well. "They do it for no reason," he said. "Anybody that's smaller than them, just to get their kicks." Khoury was not seriously injured in the beating, but he has been unable to go to school because of the threats he and his family have received since the Jan. 11 attack. He said the teens, who range in age from 15 to 17, had bothered him before and said his family will likely have to move to a different town. He also told Fox 29 that he believed he had been targeted because his family is from Liberia. On the video -- which the teens later posted to YouTube -- Khoury's attackers can be heard laughing at him as tries to get away. And one young woman, apparently a fellow student, is seen on the tape ignoring Khoury's cries for help and simply walking away. 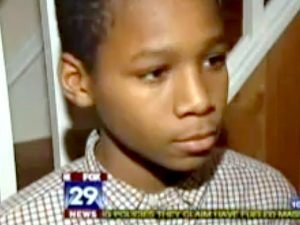 - Mara Gay, Feb 2011 ('Bullying' Teens Busted After Beating 13-Year-Old [VIDEO]). Watch: bullying Victim Gets Surprise Visit on "The View"
Nadin Khoury, Bullied Pennsylvania Teen on "The View"